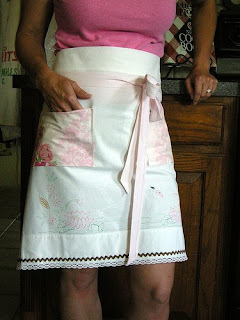 She Shall Be Called Woman: What is your Apron Style? Aprons are a blessed thing. Just putting one on can transform your mind set as a keeper of the home. In my experience, depending on which collar we put on our dog, he will know what is expected of him. If we put on his training collar, he knows its time to learn. The same goes for our horse. When she has her show bridle put on, she knows it and she carries her head higher and there is a new spring in her step. The same seems to go for me when I put my apron on. My mindset changes and I feel the sky is the limit as far as what I can clean, organize, cook, plant, etc. It also takes me back to my grandmother's era, where woman took great satisfaction in being the keeper of the home. There was no question as to who they were or where they belonged. They did not fear losing their job. They did not have to pay for professional clothes, hair, make-up, fancy nails, gas to work, and extra car insurance.... all the while wondering why, if they were so "successful" did they not feel satisfied? Oh and the never ending question of where do I stop to get dinner for the family? The cyclone of all that that entails, used to swirl in my mind daily. BUT not ever again! For I am the Keeper of the Home and I take great satisfaction in knowing that it is where I belong and in the fact that it is what is best for my family. The eternal effects of this one lone decision are astronomical. So.....all of that to say, I love aprons. They are one of my many tools of success in my position and they can be so much fun and they also tap into my creative side. Have you ever made an apron? 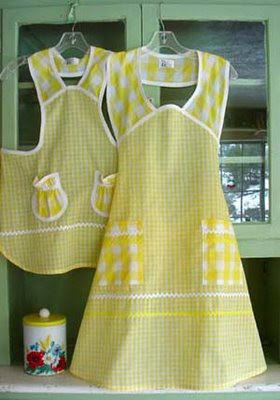 I haven't, but lately I have been finding all kinds of apron patterns and ideas that look SO fun to make and personalize that I had to share them with you and hopefully spark an idea for you to try. I really like the gingham shown in the top picture and the style of the apron, but so far I haven't been able to find a pattern for it. If you do, please send it to me! Here is a picture of a beautiful and extremely handy apron to have. Be sure to follow the source link and it will lead you to the wonderful site of On Just A Couple Acres for her well detailed Tutorial. 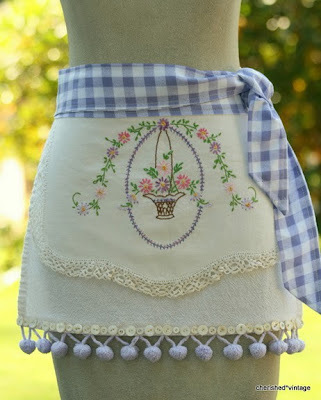 This is a terrific apron to have for the garden! This next one comes from my dear "bloggy" friend from The Unliberated Woman. 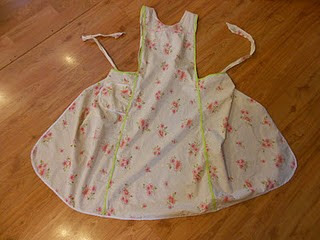 On her site you will find great instructions on how to re-make your favorite apron. For example, we have a beautiful, vintage apron that belonged to my dear Grandmother. She lived well into her mid-90's and has been gone from us for several years now. 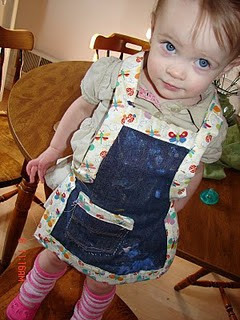 I would like another apron, made just like the one she passed down to me and now I know how to do just that by following this Tutorial. Whatever your style may be, here are several designs, patterns, links and tutorials. Create to your heart's desire! If you have any links, tutorials or pictures you would like me to share on a future post, please contact me. This one has a darling idea for adding a dishtowel to the waist band. This one is made from a vintage dish towel. This one is made from a vintage pillowcase. I hope these have blessed you and inspired you! These links have more than just aprons to choose from, there are some beautiful dresses, skirts, tops and nightgowns too. Anyone looking for Historical or Re-enactor resources or very plain dress resources, please visit the Quaker Jane link above. 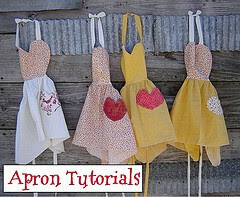 Feel free to look at ALL of my Apron pictures, patterns and tutorials on my Pinterest Apron board. Please note that I have tried my best to link back to every original site in order to give credit where credit is due. If any of these are yours and you would like them removed, please contact me. I found you on the Homestead Revival Barn Hop. 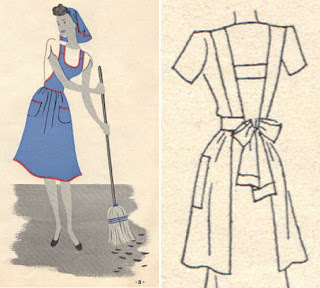 I love vintage aprons...well, aprons from any decade really! I'm hosting an Apron Challenge over at my blog if you're looking for more inspiration. You really should sew one up though. They aren't hard to do, and you'll be so satisfied in your gingham! Aprons put me in the mood for work! Thanks for all the wonderful links! I completely agree; when I put on my apron, everyone including myself knows I mean business! It really helps put me in a cheerful mood, ready for cleaning, cooking, and baking. 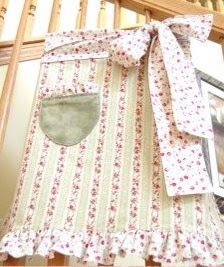 I love to collect all types of aprons but my favorites are full aprons with feminine touches to them. I love ruffles and cheerful colors. Great post, thanks for sharing the links. I really like these! I too love aprons and would like to have more of them! I am learning how to sew and am trying to get up the nerve to attempt making one of my own. There is something special and nostalgic about them. I think they go a long way in helping you get into the homemaker mindset like you said. Almost like putting on your uniform for work. Wonderful apron links, I just purchased some fun fabric that I intended to make an apron from, but hadn't found the right pattern yet. I should have no trouble now :) Thanks! I love the apron for the garden. I'm going to share this with my daughter who has a passion for sewing aprons. Thanks for linking to the blog hop. Hi! I totally agree about how putting on an apron changes your mindset. I have a beautiful 1940's wrapover apron; every time I wear it I feel a link to those strong, courageous women who kept their families going during times of war. I made myself another one by simply drawing round the original (leaving room for seam sewing) onto a colourful, flowery old bed sheet and edging it with contrasting bias binding. I don't have a machine to sew with as I enjoy hand sewing. I also have different aprons for gardening/cleaning animal housing, cooking and house cleaning. I love my aprons!! Hawthorne~ I need to look for a pattern for a wrapover apron, they are one of my favorite designs and I don't have one! 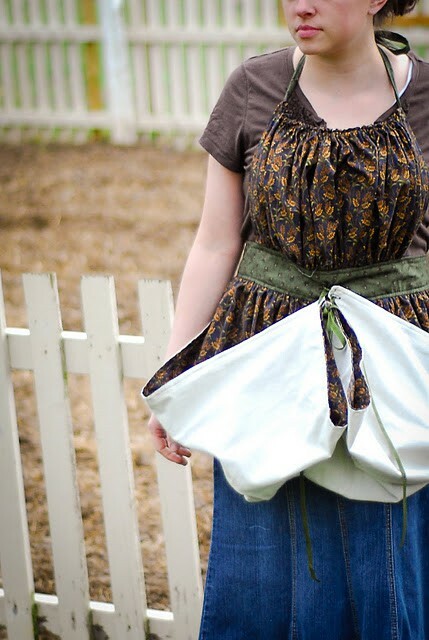 What a great idea to make an apron out of an old sheet! I'll be using up every old sheet I have now :) My hand sewing leaves much to be desired. As a child I was never taught how to stitch and now, arthritic hands won't allow much of it, but I sure admire those that do. It is almost a lost art. I remember fondly, my grandmother asking me to thread her needle and then I would just sit and watch while she mended things by hand. Now I could kick myself for not learning more from her. I do like my aprons. They certainly are functional, and I love seeing all the ways to personalize them. Wonderful post. Thank you for sharing, Sharon. Would love to feature it on Domestically Divine. I need one picture and will link back to you. I've made simple aprons (never had a pattern, only a "process" for several years, always giving them as bridal shower gifts. And I wear one most of the time. The ironic part is that of the aprons I currently have for myself, only one is one that I made at all, and it's a huge muslin one from when I was volunteering at Hagley Museum in Wilmington! I love the yellow aprons at the top of your page. Where can I get a pattern for that one? Please let us know.